Sometimes life is just plain overwhelming. 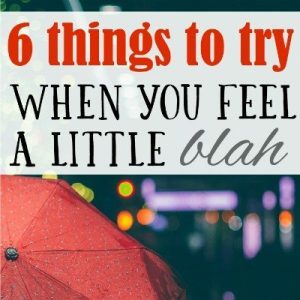 But if you’re feeling overwhelmed on a regular basis, you might benefit from this simple mindset shift. You can end your day feeling accomplished instead of defeated, and it has nothing to do with how much you’re actually doing! As soon as I saw the title, I knew it was something I had to read. I’ve been budgeting my family’s finances for years, and while I think I do a decent job, I am notorious for always going at least a little bit over budget. I’ll roll extra expenses from one month into the next, hoping that I’ll make up for it by spending less that month. That never happens. The cycle just continues. 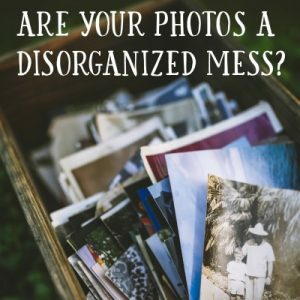 After reading Rosemarie’s post, I realized that while my “rollover” approach might make me feel better in the moment, it’s actually setting me up for failure. I’m starting each new month with a defeated attitude toward our finances, knowing I’m going to have to cut a lot of corners to stay on track. And when I impose strict limits, it’s inevitable that I’ll overspend again. The “weird” trick she suggests is to set your for more than you think you need. The psychological effect of knowing you have a cushion will actually inspire you to save, so you end up under budget. I agree that the tip did seem unusual at first, but I’ve been putting it into practice this past month, and I’ve noticed a positive change in my mindset and in my budget! Our minds are strange little things, aren’t they? 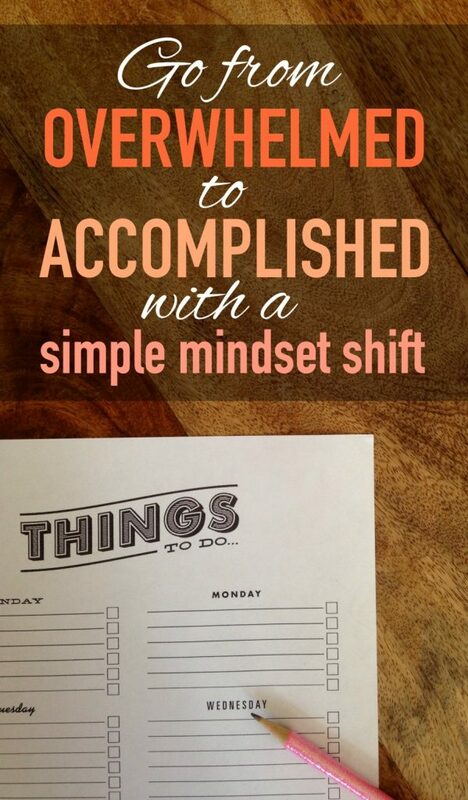 As I thought about this tactic more, I realized that I could apply the same way of thinking to my daily “to do” list. How many times have I gone to bed feeling overwhelmed because I only accomplished half of the things I wanted to do? How often do I start the day feeling overwhelmed because I know there’s no way I’ll get through all of the things I want to do? I decided to start treating my time in the same way I’ve been treating my budget: as something of abundance instead of scarcity. And instead of setting myself up to fail, I set myself up for success each and every day. Here’s how. I used to create a monstrous daily “to do” list and just work my way through it each day, adding, crossing off, and re-prioritizing as needed. 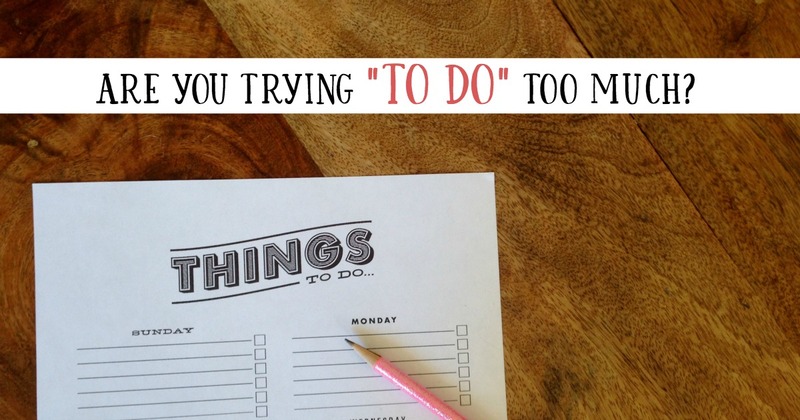 No matter how much I got done on a given day, there was always more “to do.” At no point did I ever feel like I was done with my list or that I’d accomplished everything I wanted to accomplish. Just like my budget, I would rollover my tasks from one day to the next, and the next, and the next. To stop this insanity, I decided that instead of referring to my long list of “to do’s” each day, I would create one daily list that only has 3 THINGS on it. That doesn’t mean those are the only things I’ll do that day, but those are the three things I’m making it a priority to accomplish. The key is making sure that all three things are COMPLETELY DOABLE in the amount of time I have. I don’t choose super simple things (brushing teeth, checking mail, getting gas, etc), but rather I select three things that will give me a sense of accomplishment. Usually at least one is related to blogging, one is related to housework, and one might be a major errand or something I need to do outside of the house. I still keep an ongoing master list of “to do’s” but I only refer to that list after I’ve completed the three things on my daily list. First, narrowing my list down to my “Daily 3” helps me to stay focused. When I was dealing with a longer list, I would often jump from item to item, and many things would only get halfway done on a given day. For instance, I’d throw laundry in the washer, but forget to put it in the dryer. Or I’d start to write a blog post and then stop in the middle because I noticed the floor was dirty and I wanted to vacuum. It’s also completely changed my mindset about my level of productiveness. Instead of feeling like a failure at the end of each day because I’m focusing on what I didn’t get done, I actually have a sense of accomplishment. When I get up in the morning, I look forward to creating my “to do” list because I know those things will get done. If I tackle some of the things on my master list after completing my three things, I feel like I got more done than I needed to instead of feeling like I only achieved a small portion of what I wanted to do. As I said, our minds are indeed strange little things, but it’s inspiring to know what a simple shift in approach can do. If you’re feeling overwhelmed by your long list of “to do’s,” please try this method out, and let me know how it works for you! I really loved your post and am actually sitting down with my calendar and trying to implement this method starting today. Thank you so much for this! I will try this out. I was just talking to my mom about my scary/overwhelming to do list. Thanks for the encouragement!